The sales industry is booming - but according to to a study by Gartner, "only 19% of women in sales are in leadership positions". Yelp is on a mission to change that statistic. 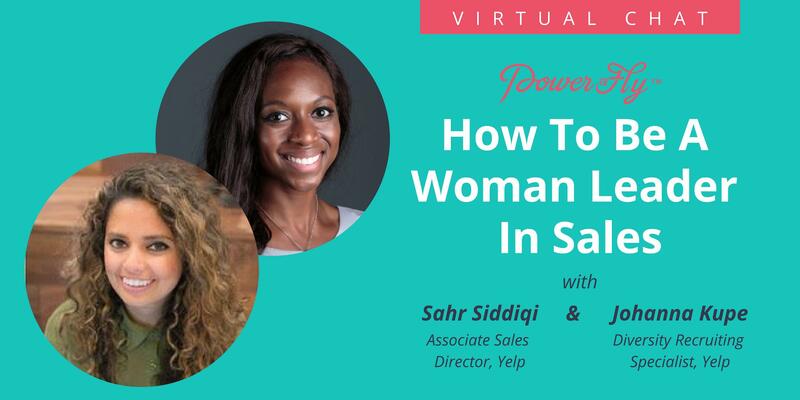 Join Sahr Siddiqi, Associate Sales Director and Johanna Kupe, Diversity Recruiting Specialist of Yelp for a live virtual Q&A; to answer all of your questions about how YOU can become a woman leader in sales! During this chat, you'll also have the opportunity to learn all about the open roles at Yelp, tips for your application, and what they are looking for in their next sales leader! What skills are needed to become a sales leader? What are three things I should be doing now to level-up in my sales career? How can I transition into a sales role? I am originally from Omaha, Nebraska and went to Creighton University which is also in Omaha. Needless to say, it was time to spread my wings from the Midwest after college and I landed a job at Yelp in Phoenix, Arizona as an Account Executive. After a year in Phoenix, I wanted to keep exploring a new city and transferred as an AE to the Yelp Headquarters in San Francisco. Over the last 6 years at Yelp I have been in 3 different leadership positions within the sales department and continue to grown and learn new skillsets every day. I'm Johanna Kupe, I was born in Europe (Luxembourg to be exact) and mainly raised in Clarkston, Michigan where I went to the private liberal arts school Kalamazoo College. I then completed my Masters at Indiana State University, and after that, I was ready to move to a new & big city and pursue a career in recruiting. I always wanted to be in a position that created a lasting, positive change in the lives of others, communities, and organizations around me. Couple that with my passion for social justice, when given the opportunity to move into the Diversity Recruiting Specialist role at Yelp, I was excited about the impact I could have on the sales department and the company as a whole. Joining Yelp and stepping into this role has been an amazing opportunity, continuing the great work of others before me and partnering with some incredible people, and I know many more great things are yet to come from Yelp. We're just getting started!